For those in the right position, July 2018 is proving to be a particularly pleasing month for gazing heavenwards. On Friday 27, the longest total lunar eclipse of the 21st century will take place. For 1 hour and 43 minutes our nearest neighbour will be totally shrouded in Earth’s shadow, appearing to turn a spectacular red-brown colour. 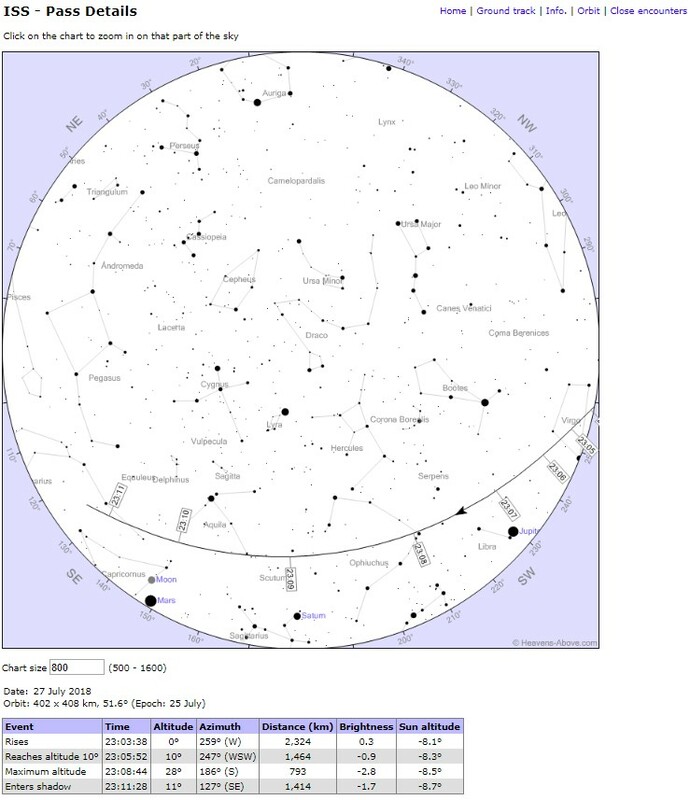 But July has even more to offer, because this month Mars will be brighter in the sky than at any point since 2003, as it passes relatively near Earth at ‘just’ 57.6 million km away. And as these two unique events take place, the International Space Station (ISS) continues to orbit Earth — capturing spectacular images, carrying out vital research, and appearing periodically above us in the skies. Mars and the Moon from the @Space_Station by @Astro_Alex. Challenge: can you take all three – #Mars, #Moon, Space Station – in one picture? Bonus points if you include the lunar eclipse. Reply to this tweet with (a link to) your picture! 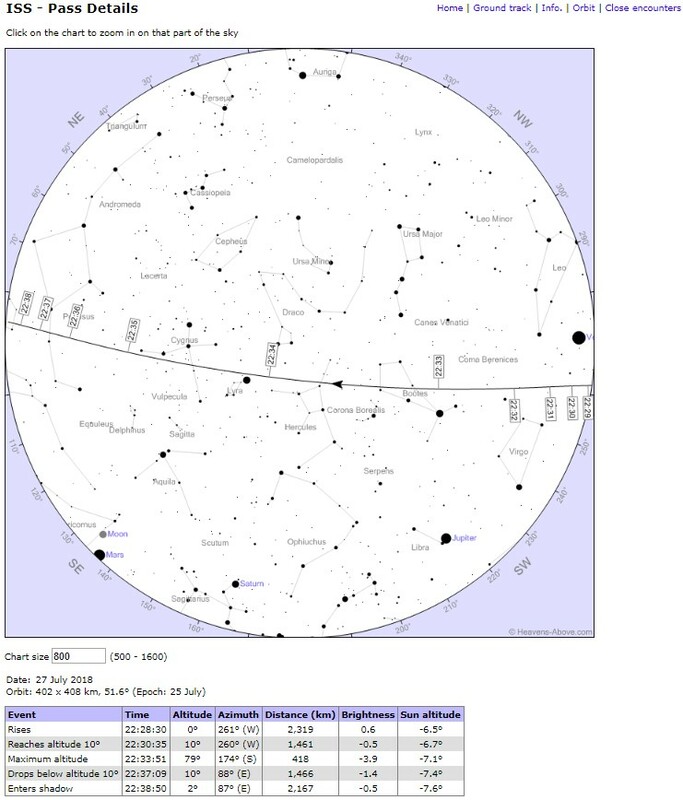 So, how likely is it to capture the Moon, Mars and an ISS transit in one picture over the coming week? 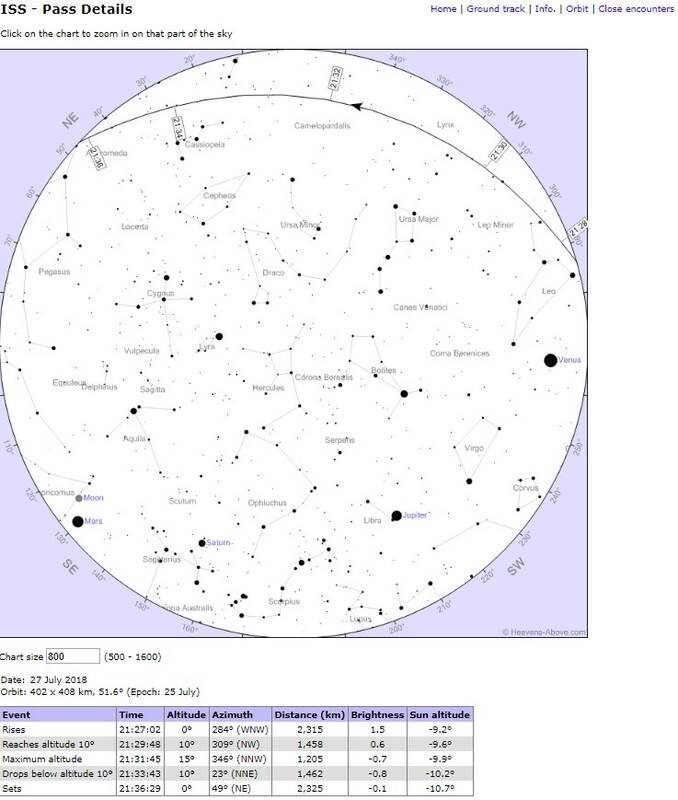 “Mars and the Moon will be quite close together in the sky in the next days (see graph below), so they are an easy target for cameras. On the night of the 27th, they will reach their closest separation at an angular distance less than 10 degrees. But note, Mars and the Moon are still several moon diameters apart, so any image with both targets in the same frame will not contain much detail on Mars, which will appear as a beautiful, reddish, big dot. The ideal conditions happen after dusk or before dawn, when the ISS is still in sunlight (not in Earth’s shadow cone). The ideal locations therefore are regions close to the ‘dawn-dusk terminator’. And of course the ISS has to fly over your head at that moment. To be able to capture the ISS, Moon and Mars in a single shot, they should be close in the sky (to be able to use normal camera lenses, not a fisheye). The closer they are the better, to adjust your zoom and get better resolution of the Moon’s surface (mainly) and Mars’ disk. For the night of the 27th, Mars and the Moon will be beautifully visible in the early night sky, to the South – South-East. 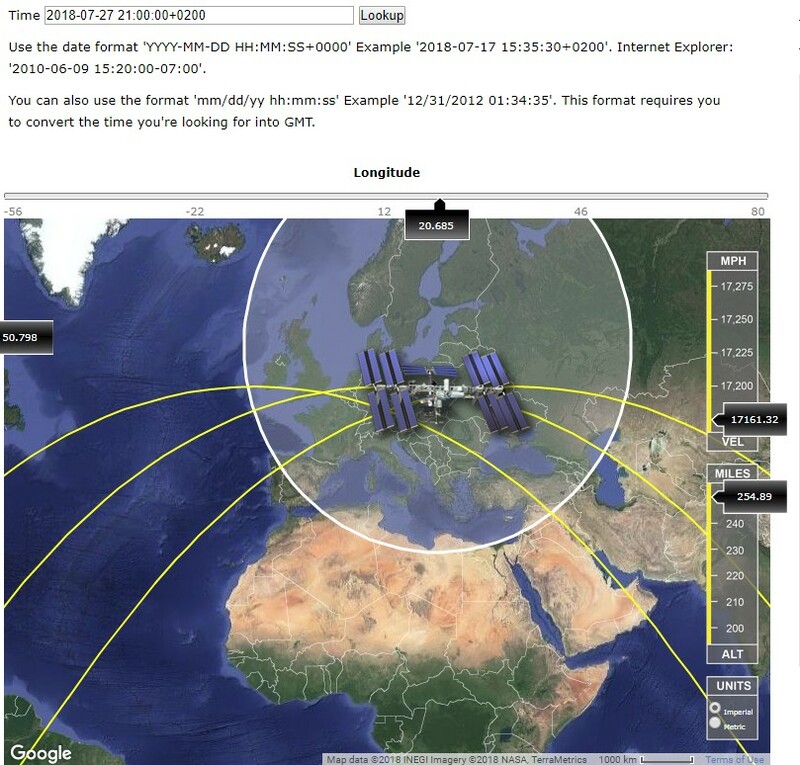 For observers in Europe, to get all three objects in the same sky region means that your observing latitude must be higher than the ISS ground track, but not so far North that you have a dark night sky. For certain parts of southern Europe, such as Spain, Italy and Central Europe, and for ESAC, in Madrid (image below), the ISS will only cross the night sky at low elevations in the northern sky, so opposite the Moon and Mars. 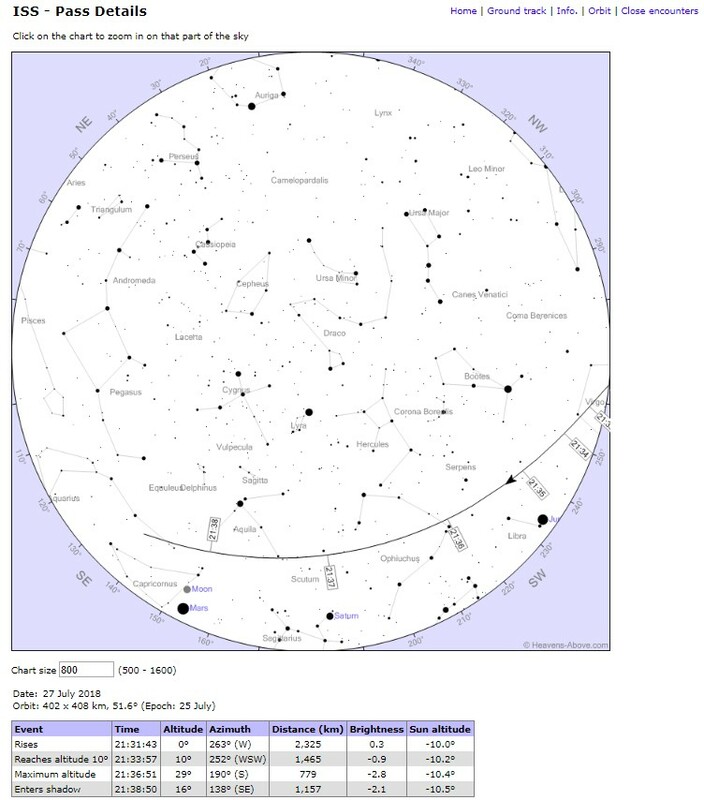 In central Europe the pass is still overhead, such as for ESTEC in The Netherlands (image below), so it will be difficult to have them in the same picture. As we move to northern parts of Europe, the three objects are together closer in the sky. For example in Inverness, at 23:10 UTC, it should be possible to capture them with less than 30 degrees of angular separation. Of course at this point Mars and the Moon will still be very low on the horizon so the observer should check the horizon mask to avoid obstructions and preferably be in high grounds. A similar geometry is achieved from Riga, Latvia, at 21:33, just after the total umbra and still in the penumbra phase of the eclipse. We would love to see any pictures taken showing the Moon, Mars and the International Space Station in one shot – even better if you manage to get all three during the lunar eclipse. Send your images to ESA’s social media channels, as a Facebook message to ESA, with hashtag #youresa on Instagram, or as a reply to the pinned tweet on @esaspaceflight. Provide as much background to how you took the picture as you can. The best three entries will be eligible to win exclusive prizes.